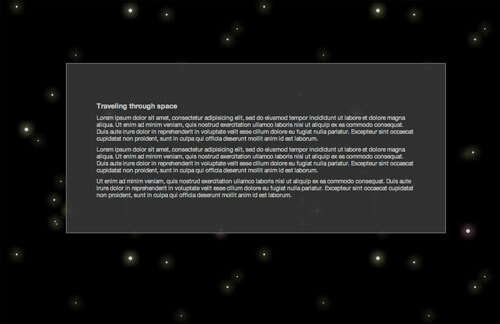 Here’s another quick CSS3/WebKit transitions project in the controversial realm of CSS animation. This time I have opted to recreate the popular parallax effect using multiple background images on a single element and the -webkit-transition property. I have based this on Chris Coyier’s parallax tutorial, reusing the star images with permission, the technique itself was coined by Paul Annett (explanation on Think Vitamin). If you’re not quite sure what parallax is, then Chris and Paul both go into some depth to explain it and Wikipedia is always helpful. 12 Feb 2012 : Exper­i­ment updated. Tran­si­tions are now widely sup­ported. Support includ­es Opera, Fire­fox and IE10. For the CSS the background container is set to a fixed position (for convenience more than anything) and spread across the bottom of the page using the top, left, bottom and right properties. The background images are defined using the background shorthand property with multiple declarations being comma delimited, the first being the top-most. Each of the images has a different position defined in percentage, so as the size of the container changes (eg on window resize) the images move disproportionately to each other; creating the impressive parallax effect. As an alternate route, albeit a temporary one, I have opted to use transitions to animate the left-most edge of the background container (for instance from 0px to -100px). This gradually alters the overall width of the container causing the backgrounds to shift disproportionately as per their percentages, creating the parallax effect. With a large enough duration and left position the effect appears to be continuous.